Developing and designing graphics and website. Also implementing WordPress Content Management System (CMS), Search Engine Optimization, Google Analytics and social media integration. Advertising the website using Google AdSense as well as hosting the website and setting up the domain name. Disney Words started as a Twitter account that tweets Disney quotes every few hours. They have 2.5 millions followers to date including celebrities such as Miley Cyrus, Jordin Sparks, Thalia, Chloe Grace Moretz, Aaron Carter, Caridee English, Jordan Pruitt, and many more. 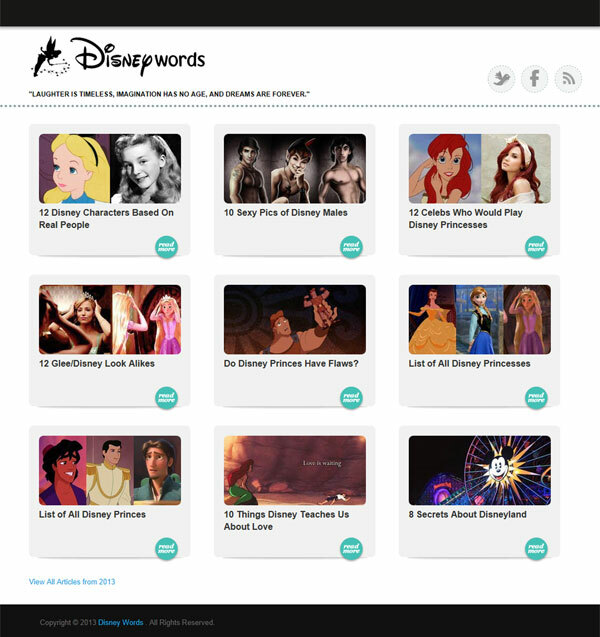 In 2013, they expanded their brand by launching their website which contains interesting and fun Disney related articles. Sadly it had to close its door in early 2018.